The Papua LNG project is expected to deliver US$20 billion (about K66bil) in direct cash flow to the State, provincial government and landowners over a 25-year lifespan. Deputy Prime Minister and Treasurer Charles Abel said this would be done through company tax, dividends, landowner royalties, provincial and local level government development levy for the State. 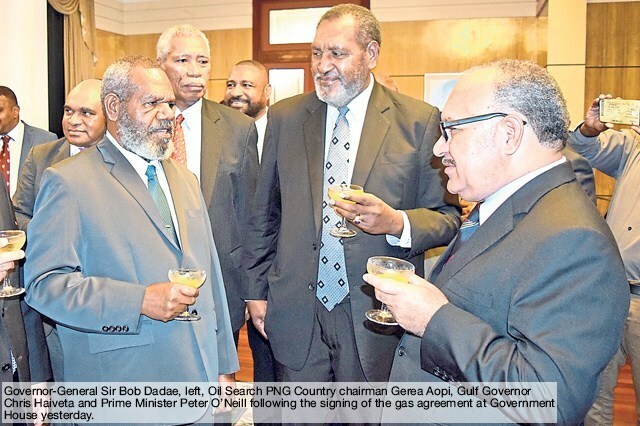 Abel described yesterday’s signing of the Papua LNG project Gas Agreement between the State and joint venture partners as another milestone for the country. “It has a US$13 billion (K43bil) construction phase to deliver gas and oil through a conditioning plant, pipeline and two 2.75 million tonnes per annum trains, which will create 10,000 jobs over five years and boost local businesses and the economy,” he said. “We have not had everything our way and made some compromises. But it represents a significant improvement on the PNG LNG project. Domestic market gas obligation of 5 per cent at US$4.50 (about K14.60) fixed price. He said it would be “a massive boost to our economy in more ways than one”.